Mythbusters testing the chinese water torture in 2008. A few years back, I saw a great episode of Mythbusters, where they tested the idea of the Chinese water torture. One by one, Adam, Kari, Scotty and Tory were each firmly secured before being subjected to the slow, rhythmic beat of droplets onto their foreheads. And one by one, each was broken down — in Kari’s case, to the point of tears — in under an hour. It’s not the most comfortable thing to watch, but it offers an obvious take-away: While some rhythms can be soothing, tight repetition can quickly drive us stark-raving mad. Of course, as web people, we already know this intuitively! Who hasn’t experienced the site with the endlessly spinning logo? Who hasn’t been driven to distraction by that industrious little construction worker toiling away behind an “Under Construction” sign? It raises an obvious question: Is it possible to use animation without introducing these mind-torturing loops? To keep things breezy to read, I’m going to use the official “unprefixed” W3C syntax (i.e. @keyframe) throughout this article, but you’ll need to use the browser-specific prefixes (i.e. @-webkit-keyframe, @-moz-keyframe, @-ms-keyframe, etc.) to see it working in real-world browsers. As you might guess, the above animation is designed to change a red background to blue. However, by itself, this code won’t do anything until we apply it to an HTML object on screen. We also need to set the time length of the animation (in seconds). Here’s that simple example in action. There are a slew of other well-documented attributes and settings, but we’ve covered the fundamentals you’ll need for now. Note: For all the demos in this article, I’m going to be using Lea Verou’s super-lovely Dabblet webapp. Apart from looking luscious and being hard-wired straight into Github, Dabblet will let you fiddle with the CSS here and see the results in real-time. The other great feature of Dabblet is that it let’s you write plain, unprefixed CSS3 while magically adding the browser-specific code in the background (using Lea’s “-prefix-free“). This is brilliant for keeping the code examples simple to read, but be aware that you’ll need to add the “-moz,” “-webkit,” and “-ms” prefixes to make this code work outside of Dabblet. This covers a lot of potential animation scenarios, from bouncing balls to spinning tires to launching rockets. Classic cel (or sprite) animation is one common answer to that problem. We’ve probably all seen the old Disney or Warner Brothers hand-drawn “cartoon cels.” Each moment in the timeline is drawn as a standalone image. Then each cel is displayed rapidly in succession to give the illusion of movement. So, how do we do that with CSS3? Let’s begin with a simple cel animation that we can develop into something more sophisticated. 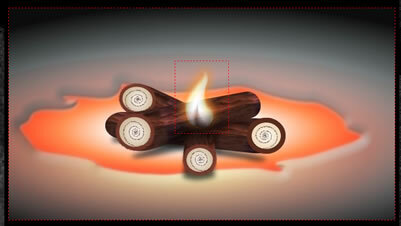 I’m starting with single .png showing a hand-drawn flame over three frames. It won’t be hard to make this image loop seamlessly. 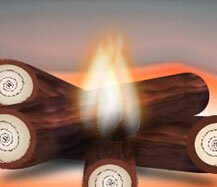 Each flame cel is 136px high by 100px wide. I’m using a container <div> (#logfire) to hold the background graphic and a placeholder <div> (#flamegroup) that will hold our flames in position. Inside the placeholder I’ve nested a third <div> (.flame) that will become our flame. I’ve embedded the flame graphic into the background-image, but we’re cropping off most of the image, only allowing the left-hand flame to show. Fantastic! Except for the part where it doesn’t look quite right. As the above example shows, it animates too nicely, gracefully sliding between frames. Just like those little page-flick animations you used to make in the corners of book pages, the magic lies in snapping each new frame into place so quickly that you can’t see the in-between state. As you can see, our first cell stays motionless from 0%-25%. Then suddenly at 25.1% along the timeline, we crank the background 100 pixels to left. Again we leave it there till the 50% mark before cranking it left again at 51.1%. If we plug that CSS into our example we now get a pleasantly wiggling flame. Flames don’t just move, they vary mildly in intensity. Since we already have the timeline set up, why not tweak the opacity a little to give it a subtle pulse? A decent result, but let’s face it: We could get something pretty close to this with a good animated .gif file. Let’s ratchet things up a little. Circling back to our original HTML, we’re going to add more flame elements — lucky we have that handy holder <div>, huh? Let’s add two more <div> elements with the “flame” class to our “flamegroup.” We’ll also give each <div> it’s own ID so we can target them separately. We now have three flame elements, but since they’re dancing in perfect unison, they still look like a single flame. Let’s delete the animation from the “flame” class and add it to our new IDs. Now we are free to call the same animation (i.e. “flicker”), but we’ll give each one a different timing to keep things interesting. Riffing on the prime number idea that we used in the cicada principle article, I’m going to set the flame elements to loop in 0.7, 1.1 and 1.3 seconds respectively (yes, I know they’re not primes). Finally, rather than stacking them precisely on top of each other, I’m going to offset each flame slightly (10-20px) from its siblings. This is mainly so we can see the edges mingle and interact. And here’s the final demo in action. A screenshot — although the static image kinda defeats the purpose. Our flames jump, dance and weave in a soft, less “GIF-loopy” manner. Sometimes you think you have the pattern nailed but then it seems to shift. Dabblet lets you tinker, so feel free to play with the timing. Obviously the slower the loop, the longer between exact pattern repeats. As I mentioned earlier, the Dabblet examples use “-prefix-free” to let us write clean, unprefixed CSS3, but you’ll need to add the “-moz,” “-webkit,” and “-ms” prefixes to make this code work outside of Dabblet. I wanted to keep things relatively simple for the example, but we could easily spice things up a little more by setting background-size height to 100%, and then animating the height of our flame <div>. This would make our flames leap and dive more energetically. Obviously, older browsers won’t support CSS3 animation, but Modernizr.com allows you to target those browsers with a fallback. For older browsers, rendering the flames statically seems to be a perfectly acceptable option. In fact, it’s hard to imagine how an IE8 user would ever become aware that other users were seeing an animation. You may sometimes see a slight “jog” or flicker randomly in the animation. It seems to be a browser buffer overflow bug, but so far I haven’t found a way to eliminate it, although slower computers seem to make it worse. We’ve also seen some evidence of our processor cycles spiking during *some* larger CSS3 animations. It seems to be linked to particular types of animation, but I haven’t isolated the key problem areas yet. Suffice to say, if you hear your CPU fan kick into overdrive, you’ve probably hit on the same issue. I think this idea of weaving together animation timings has some interesting potential, so watch this space in the coming weeks for some more experiments. Subtle sunlight, water, and clouds effects come to mind. And if you have any ideas of your own, make a Dabblet and share them here. This code would generate three stages in-between the steps that we’ve manually set out in our @keyframe code.When using sprites, we don’t want show ANYTHING between changing sprites so we just set our steps to 1. This allows us to greatly simplify our flame timing loop. Here’s an updated Dabblet showing it working.